This entry was posted in Campus Announcement and tagged auburn university, College of Liberal Arts, dean on June 27, 2013 by Wire Eagle. AUBURN UNIVERSITY – Following a national search, Joseph Aistrup has been named the dean of Auburn University’s College of Liberal Arts. Aistrup, currently the associate dean of the College of Arts and Sciences at Kansas State University, will begin his appointment Sept. 1. This entry was posted in Campus Announcement, Faculty, Staff and tagged dean on February 13, 2013 by Wire Eagle. AUBURN UNIVERSITY – Auburn University veterinary professor, department head and alumnus Dr. Calvin Johnson has been named dean of the College of Veterinary Medicine after a national search, effective March 1, announced today by Dr. Timothy Boosinger, Auburn provost and vice president for academic affairs. 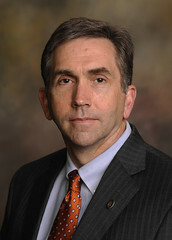 Johnson, head of the Department of Pathobiology, joined the Auburn faculty as a professor in 2003 and was named department head in 2005. His experience also includes 11 years at the University of Florida. This entry was posted in Campus Announcement, Faculty and tagged dean, Samuel Ginn College of Engineering on April 13, 2012 by Wire Eagle. AUBURN – Chris Roberts, department chair and the George E. and Dorothy Stafford Uthlaut Professor of Chemical Engineering in Auburn University’s Samuel Ginn College of Engineering, has been named dean of the college effective July 1. Roberts succeeds Larry Benefield, who is retiring after 33 years at Auburn and who has served as dean of the college since 1998. This entry was posted in Campus Announcement and tagged auburn university, College of Architecture, dean, Design and Construction on April 7, 2011 by Wire Eagle. AUBURN – Vini Nathan, dean of the School of Architecture at Philadelphia University, has been named dean of Auburn University’s College of Architecture, Design and Construction, effective July 1. “Dr. Nathan’s experience, in the classroom and as a practitioner and administrator, will be a valuable asset not only to the college but also to the entire Auburn University community,” Provost Mary Ellen Mazey said. This entry was posted in Campus Announcement, Faculty and tagged dean, forestry, sciences, wildlife on November 1, 2010 by Wire Eagle. AUBURN – Jim Shepard, professor and associate director of the Forest and Wildlife Research Center at Mississippi State University, has been named dean of Auburn University’s School of Forestry and Wildlife Sciences, effective Jan. 3. This entry was posted in Campus Announcement, Faculty, Staff, Students and tagged dean, foy, james on October 9, 2010 by Wire Eagle. James Edgar Foy, one of the most widely known and beloved figures at Auburn University for more than half a century, died Friday evening in Auburn. He was 93. Visitation will be held Tuesday, Oct. 12, from 5 to 7 p.m. at Jeffcoat-Trant Funeral Home and from 10 to 11 a.m. on Wednesday, Oct. 13, at Auburn United Methodist Church’s Founders Chapel. Funeral services will be held Wednesday, Oct. 13, at 11 a.m at Auburn United Methodist Church. Burial will follow in Fairview Cemetery in Eufaula at 3 p.m.
As Auburn’s dean of student affairs for a quarter century and a volunteer on campus for 30 more years, Foy became one of the most iconic Auburn figures of the last half of the 20th century.